Today was our time to say goodbye to our precious 11 yr. old Maltese dog Buttons. Her health wasn't good and then she dislocated her hip. Yesterday and this morning were not pleasant for her. She was such a sweet dog and especially close to my husband. This evening it's been amazing how we expect her to be at our feet, or following us across the room, or running to the kitchen when she heard one of us chopping salad vegetables. She loved lettuce, but carrots were her special treat! She's traveled all over the United States with me as we joined my husband wherever his current assignment took him. Buttons would sit patiently in the back seat while I harnessed her and then attached the seatbelt. She'd sleep unless she heard me eating something, then she'd sit up and wait for her nibble. Hotels became part of her life. She knew about elevators, hallways with other dog smells, and she didn't mind taking the stairs sometimes. She knew right where her travel bag was and where to find the refrigerator in any hotel that would become our temporary home. She could watch television contentedly but didn't like basketball, black and white shows, or line drawings in advertising. 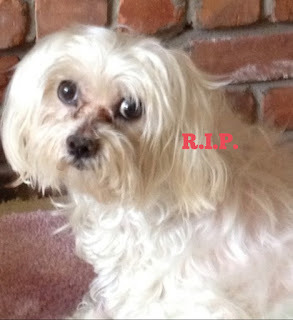 Her only babysitter was a neighbor friend who not only loved and spoiled Buttons, but watched TV with her too. Our dogs know us, love us, try to please us, and appreciate whatever routine we can give them. We loved and knew Buttons very well too. Her shadow now lingers throughout our home. We are grateful she was here.